This was quite the unconventional approach to drying a field, but it didn't pay off, and the game was postponed. 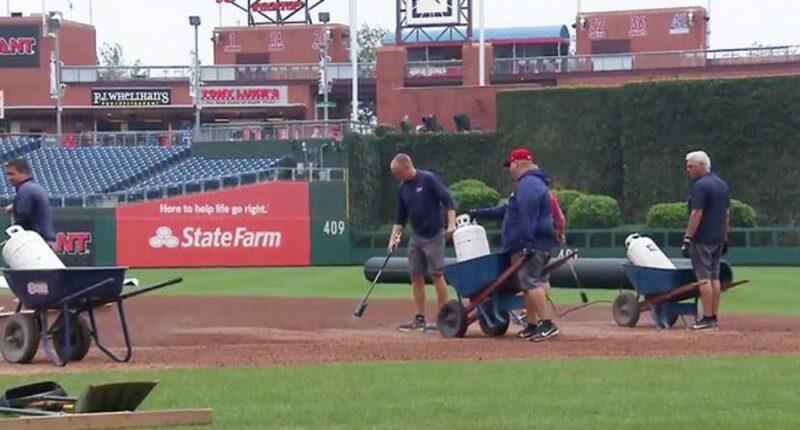 Heavy rain hit much of the East Coast this weekend, and that led to several sports cancellations, including the Washington Nationals’ home game against the Chicago Cubs. The Nationals are now on the road against the Philadelphia Philles, and it’s stopped raining, but they still might not get to play thanks to the sodden ground at Citizens Bank Park, which apparently wasn’t properly tarped Friday and never got the chance to fully dry thanks to the weekend’s rain. The groundskeeping staff sure made an effort to get the field ready, though, including using…flamethrowers? Harper has picked up a rake. He tried it out. Now he's tossing drying agent on the field like he's feeding birds. Bryce Harper is trying to scatter diamond dry on the field. This is where we are. Game is postponed. They’re not playing on this surface. Going to try for a doubleheader tomorrow.